In two previous posts, we have discussed Convolutional Coding  and the associated hard decision Viterbi decoding . In this post lets extent Viterbi decoding algorithm to soft input decision scheme. The modulation used is BPSK and the channel is assumed to be AWGN alone. with mean and variance . In the hard decision Viterbi decoding, based on the location of the received coded symbol, the coded bit was estimated – if the received symbol is greater than zero, the received coded bit is 1; if the received symbol is less than or equal to zero, the received coded bit is 0. In Soft decision decoding, rather than estimating the coded bit and finding the Hamming distance, the distance between the received symbol and the probable transmitted symbol is found out. As the Viterbi algorithm takes two received coded bits at a time for processing, we need to find the Euclidean distance from both the bits. 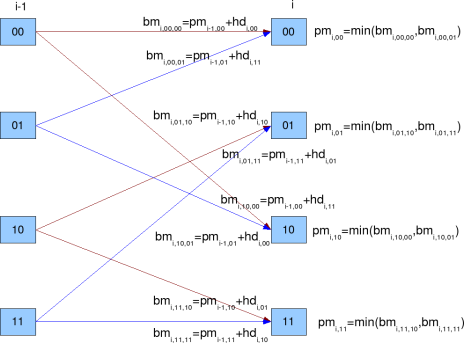 Summarizing, in Soft decision decoding, Euclidean distance is used instead of Hamming distance for branch metric and path metric computation. 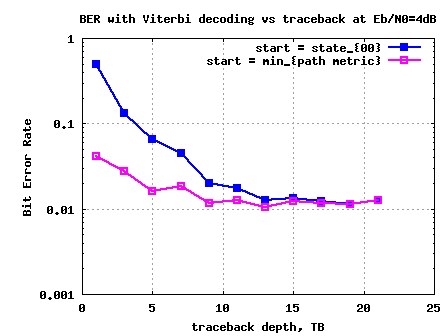 For details on branch metric, path metric computation and trace back unit refer to the post on hard decision Viterbi decoding . 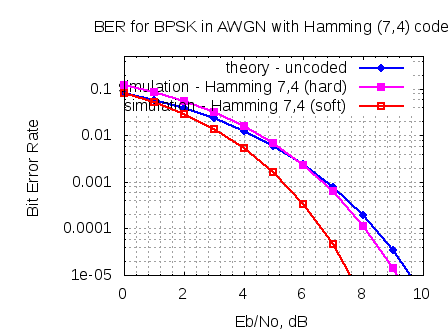 Octave/Matlab source code for computing the bit error rate for BPSK modulation in AWGN using the convolutional coding and soft decision Viterbi decoding is provided. (f) Repeating the same for multiple Eb/No value. 1. When compared with hard decision decoding, soft decision decoding provides around 2dB of gain for bit error rate of . 2. 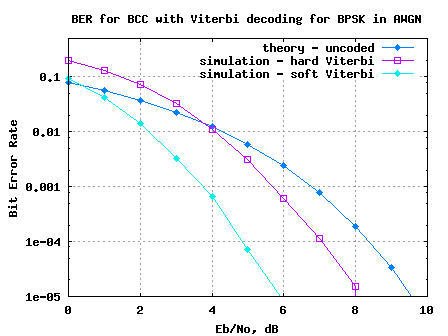 In the current simulation model, soft bit are used with full precision for obtaining the BER curves. However in typical implementations, soft bits will be quantized to finite number of bits.